Hard Rock Cafe Piccadilly Circus opens in 2019. In the city where the first Hard Rock Cafe in the world opened, back in 1971, a new state-of-the-art cafe comes to town and it includes the world's largest Rock Shop. In addition to the Hard Rock Cafe in Hyde Park, this multi-level cafe in the heart of London occupies a site that's more than 1,800-square-metre. The decor at the Hard Rock Cafe Piccadilly has a modern look - with m emorabilia from contemporary homegrown artists such as Charli XCX, Ellie Goulding, Ed Sheeran and Amy Winehouse - an open kitchen and a design style that draws on the city for inspiration: from Victorian glazed tiling to the fabrics and colours of the London Underground. What hasn't changed is Hard Rock's mix of authentic American food, music, merchandise and entertainment with a stage in the main dining room set up for live music performances. 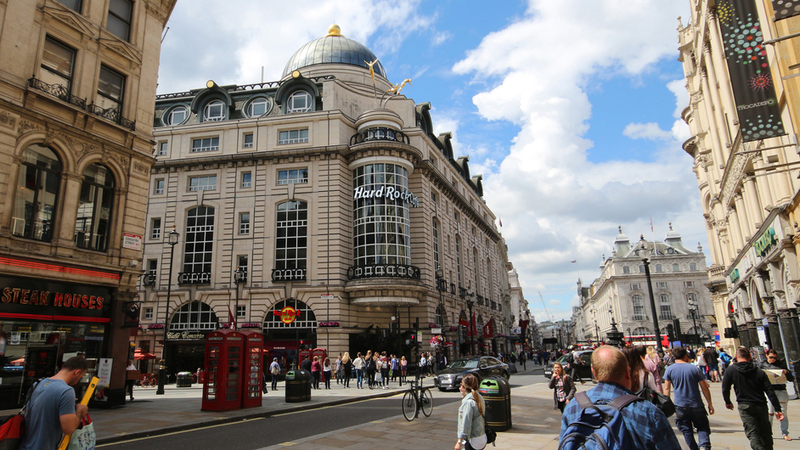 Hard Rock Cafe Piccadilly Circus gyms, sporting activities, health & beauty and fitness. The best pubs near London Hard Rock Cafe Piccadilly Circus. Hard Rock Cafe Piccadilly Circus clubs, bars, cabaret nights, casinos and interesting nightlife. Where to have your meeting, conference, exhibition, private dining or training course near Hard Rock Cafe Piccadilly Circus. From cheap budget accommodation to luxury 5 star hotels see our discounts for Hard Rock Cafe Piccadilly Circus hotels, including Cafe Royal Hotel from 97% off.